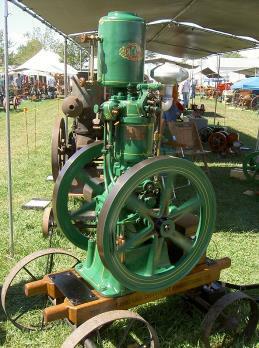 The Rock Island Plow Company was a major seller of gas engines from 1912 onward; however, the company never manufactured their own engines. 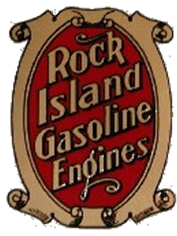 Instead, Rock Island would make agreements to act as vendors for manufacturers to sell other companies engines under Rock Island’s name and colors. Two companies worked with Rock Island in this way, Jacob Haish of Dekalb Il and Alamo of Hillsdale MI. Prior to the agreement with Jacob Haish. 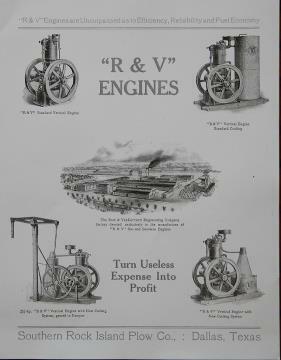 Rock Island also served as a distributor for the Root & van Dervoort Company of East Moline IL from 1909 -1912, These engines were sold under the R&V name and colors without Rock Island badging and RIPC had no direct role in the manufacturing or support of the R&V’s, so are only briefly included in this section. R&V also had extensive ties with John Deere, so it was certainly economical to obtain a new favorable contract with their own badging. John Deere also heavily increased its demand for engines as its branch houses expanded into the engine market during this time period, so R&V may simply not been able to handle two major customers. It is also entirely possible, John Deere as the senior customer, did not like Rock Island sharing its product line and issued an ultimatum. Whatever the circumstance, the partnership was brief. 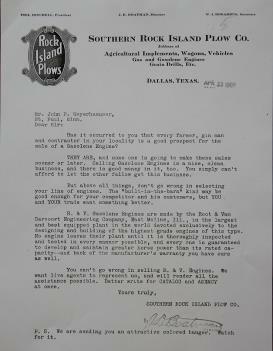 I have obtained a copy of the original ad and the and cover letter from the Southern Rock Island branch house in Dallas Texas shown below. Interestingly, R&V in the 1920’s would also become associated with the Moline Plow Company, giving it ties to all three of these major local companies. There is much debate on the exact color of Rock Island engines, but Dulux 93-24590 brown seems to be a common standard. However, after talking with a few owners of Rock Islands with original paint, it appears Rock Island did NOT have a uniform paint color. 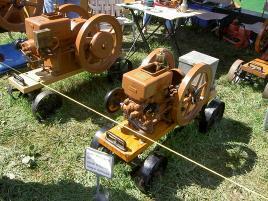 Original engines have now been reported ranging from a pale mustard to a dark brown. Perhaps date of manufacture or hp had a bearing on the color? 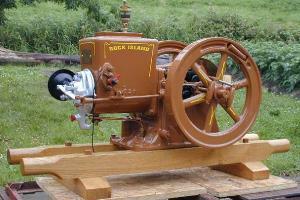 Some Haish/Rock Island engines have been noted with other colors, primarily red and gray while a 1 hp, 4hp and a 6 hp Haish have been observed with a darker brownish color with black pin striping original paint, so it seems unlikely the Rock Island mustard color is correct for a Haish Rock Island. I started a thread on smokstak to discuss this. I would also like to touch on C.H. 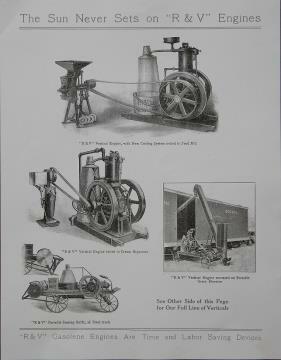 Wendel’s Ameican Gasoline Engines since 1872 Vol 1 (I haven’t looked at volume 2 yet) since Wendel is often quoted as the first reference. In this book, Wendel has a large section on Rock Island, but barely touches on Haish and Alamo. The result is a large amount of general information on Alamo and Haish seems to have been lumped into Rock Island, and at least some of it might not apply. Unfortunately, I don’t have enough information to verify or disprove certain Wendel statements, but a number of models and information listed do not correspond to confirmed models. For that reason, I would recommend caution in regard to using Wendel as a main source of information on Rock Island engines. I have to apologize as the gas engines are an area I have limited resources and experience in compared to the implements, history and tractors. For this reasons, these sections will be somewhat sparse for the time being. Again, if anyone has literature or resources I can use, I would immensely appreciate it as well as any corrections or additions someone might make. However, unlike the other sections, there exist resources for both the earlier Haish engines and the later Alamo’s by other people and are well worth checking into. For that reason, I have not devoted the space as much space to the companies history as I have in other sections, instead I will try to focus on the specifics of the Rock Island line. 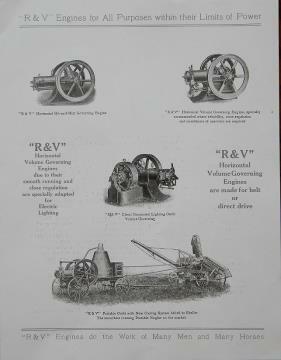 1909-1911 Root & Van Dervoort Engines Below is a b&w copy of the brochure and cover letter sent out by Southern Rock Island Plow Co.